Although bats are one of the most diverse groups of mammals today, they are one of the least common groups in the fossil record. Bats have small, light skeletons that do not preserve well. Also, many live in tropical forests, where conditions are usually unfavorable for the formation of fossils. Thus we know little about the early evolution of bats. Some mammal teeth from the Paleocene of France show characters of both bats and insectivores (the group including the hedgehogs, shrews and moles of today). However, since these fossils are only teeth, we don't know what the rest of the animal was like. The next bat fossils start turning up in the Eocene, in sites with unusually complete preservation of whole skeletons, such as the Green River Formation of Wyoming and the Messel Shale of Germany. 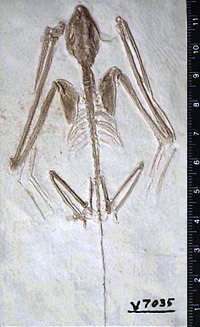 These fossils represent essentially modern-looking microchiropterans; bats had evolved all of their characteristic features and begun to diversify by this time. In fact, the oldest known complete fossil bat, the Eocene-age Icaronycteris shown at left, shows specializations of the auditory region of the skull that suggest that this bat could echolocate. The oldest megachiropteran (flying fox, or fruitbat) is Oligocene in age, from Italy; it and a Miocene fossil from Africa make up the entire known fossil record of megachiropterans. While not extensive, the fossil record of bats shows that several bats once had a very different geographic distribution from that seen today. While the oldest fossil fruitbat is from Italy, fruitbats today are restricted to tropical areas of Africa, Asia, and Australia. And while true vampire bats today are found only in tropical Central America, only a few tens of thousands of years ago they were found in northern California. Search the UCMP Vertebrate Type Collection Catalogs for records of fossil bats. Use the term "Chiroptera" for all bats or "Desmodus" for the vampire bat. Carroll, R.L. 1988. Vertebrate Paleontology and Evolution. W.H. Freeman and Co., New York.